You are currently browsing the category archive for the ‘Tax The Rich’ category. Came across an amazing chart from the Paris School of Economic’s database. It allows you to customize your search for any time or place over the world. 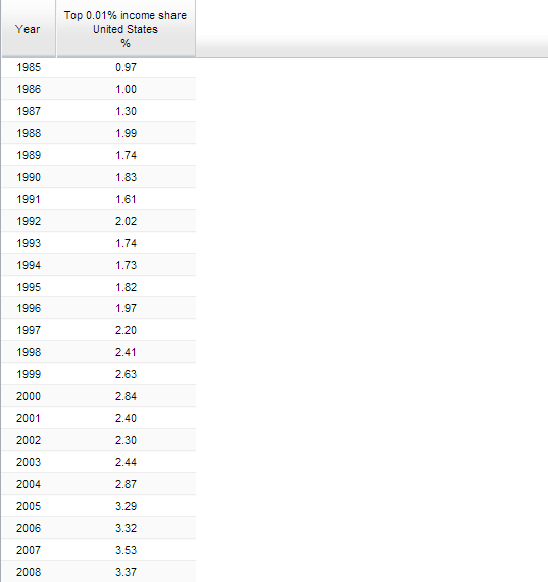 My area of expertise is within the US and here is what I wanted to see: the percentage of national income earned by the top 0.01%…. not just the top 1%, but the top-tip 0.01%. 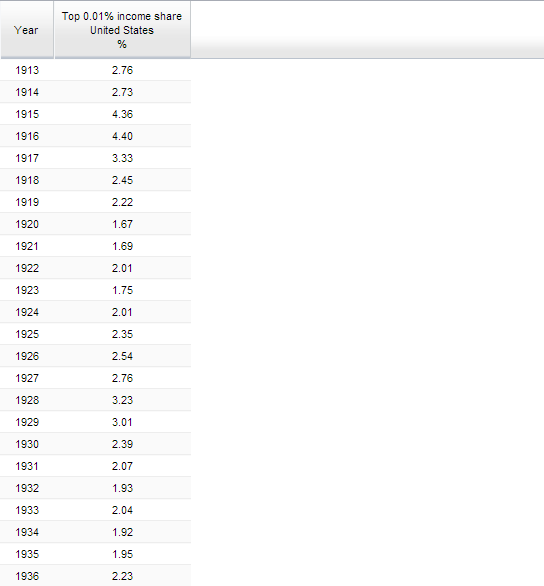 This shows the past 100 years of national income percentage earned by the top 0.01%. There are some very striking facts noticed by those looking at this data for the first time. 1) The year 2012 was one of the record highest, beaten only by two years during WWI when the rest of the world was embroiled in war, and our top echelon were selling to both sides…. If one extracts that exception, then in 2012 we gave the top 0.01% (one hundredth of one percent) more of our national income than at any time previously recorded. 2) The Great Depression did little to affect the income percentages (1928-1932); Roosevelt however (1933-onward), did a lot. 4) The Reagan Tax Cut of 1986 caused a doubling of the top 1%’s income in just 2 years. 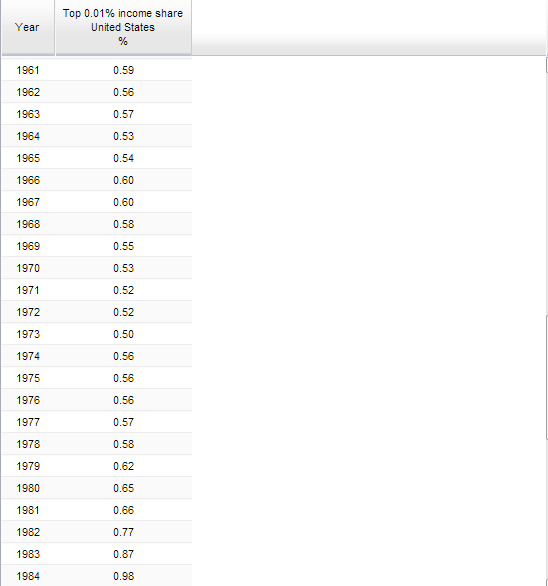 from 1% in 1986 to 1.99% in 1988. 5) The percentage again dropped under 2% after Clinton’s tax hike in 1992 causing a robust expansion, but passed that 2% mark in 1997 never to return. 6) During the “w” Bush years, the percentage continuously climbed peaking in 2007 and would have peaked higher in 2008 but the recession clipped the last two months off that year. 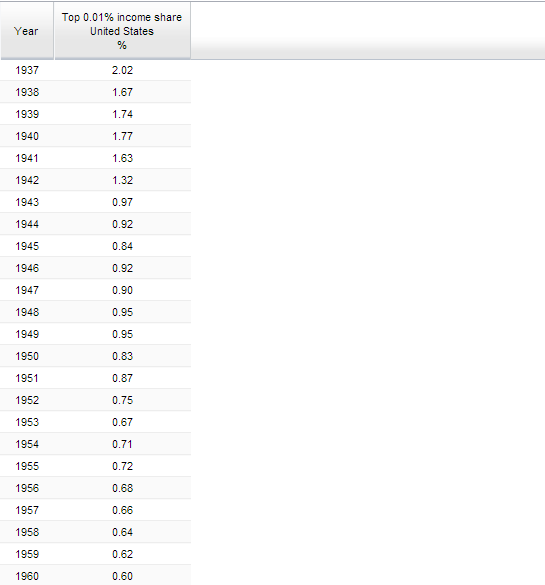 Despite that, 2008 was the 2nd highest grossing percentage up to that time (discounting the WWI anomaly) across almost 100 years of data. 7) The Great Recession (2008-9) as did the Great Depression (1929-32), had little effect on the top 0.01% percentage of national income. At no point did their yearly take dip below 3%, a mark first crossed in 2005 (if one continues disregarding the anomaly of the First World War). 8) The rebound ability of an economy at large is hampered when more money collects at the top and is not returned as investment to the bottom. Though small in percentage points, those difference of those 3 percentage points ( from under 1.0 to 4.0) translates to $500 billion that did not impact our economy because it went to less than 31,000 Americans. Considering our TARP was passed only for $800 billion, we only saw $300 billion net running through our economy. because $500 billion of the $800 billion was handed over to less than 31,000 people then quickly whisked away to foreign bank accounts beyond the reach of the IRS. 9) Although difficult to state through all the multiple influences that impact economies daily, the extensive overview shown by this chart makes it clear that were we to have another great recession, we should first use the incomes of our top 0.01% to first rebuild our national economy as did Roosevelt, and not assume that those wealthy will do so voluntarily as did our creators and negotiators behind this current rebound. 10) Data from 2013 will be most interesting. The Bush Tax Cuts for the top 0.05% were rescinded that year, and at that point, our economy took off ( at least when Republicans weren’t threatening to shut it all down). If it does indeed show a drop in the top 1%’s income, then we will know that in order to have robust recoveries, those at the top need to be taxed more, not less. As for politics, this needs to be taken to heart. Anyone who argues for less taxes on the top 1%, be they Democrat or Republican, needs to be shown the door…. We now have sufficient data to know with certainty, and from it, we can see all evidence points that higher marginal tax rates do benefit the middle class and subsequently the economy at large….. This historical chart rings that out, clear as a bell at the end of a day’s trading…..
Having just returned from a Gates sponsored seminar “ to further hardwire the Common Core curriculum ” (Gate’s words; not mine; notice he said “curriculum“) Mr. White opines us on what he learned. He was most taken with a story from Deborah Ball, now dean of education at the University of Michigan in Ann Arbor, who was teaching her third grade students about odd and even numbers, when one student, Sean, said that he thought some numbers were both odd and even. It is obvious this was an exercise at the conference. For Mr. White asks us how we should respond…. We are given three options. Teacher A responded that there are no numbers that are both odd and even and that you can always tell which are odd and which are even by which are divisible by two and which are not. Those evenly divisible by two are even and the others are odd. She then moved on with her lesson plan. Teacher B asks the student to explain why he thinks some numbers are both odd and even. He says that because two goes into some even numbers (like 6 or 10) an odd number of times, those numbers are both odd and even. The teacher says that is a very interesting thought, but then goes on to explain the rule to him as had been done by Teacher A and moves on with the lesson. Obviously I’m not a Common Core enthusiast. Did you see the part that the teacher “suspends” her lesson plan to cover something totally ridiculous as naming numbers “Sean numbers”? The immediate question is…….. when will they cover what they were supposed to do THAT DAY? Tomorrow? If so, what will be missed on the test because the Smarter Balanced Assessment is tightly wound so everything covered in class, is used on the test… Will each of these children lose 150 points because they missed a most important element of multiplication, because they were kept behind by talking about “Sean numbers”? Remember the test examples we showed you, so complicated that adults cannot even figure out what is being asked? This is ruining children… Remember where we said the child’s brain is growing and must get a certain amount of knowledge in on a timely fashion, or it is lost forever? How does spending a full day on Sean numbers, probably something everyone in the class except Sean had already grasped, help a child in this race against time? Most of all, this is an example of taking something really simple…. and making it really complicated…. This is exactly why Common Core is so rotten at it’s core…. Remember in high school where certain cliques made up certain rules, and everyone in-the-know had to follow them, and those not in-the-know, were ostracized and put down? I want you to keep this in mind as we go through the rest of Mr. White’s essay…..
Whose pupils, Teacher A’s, B’s, or C’s, would do better on Common Core standards? Teacher A seems out of step with the Common Core values as she was not even curious about Sean’s reasoning, although she did explicitly correct what she took to be his error. Teacher B went further in exploring Sean’s reasoning, surely something expected in the Common Core, but Sean was more or less left with the idea he was not doing anything worthwhile mathematically. Teacher C seems to embody the Common Core’s values of having Sean “make sense of problems and persevere in solving them, reason abstractly and quantitatively, construct viable arguments and critique the reasoning of others, attend to precision, look for and make use of structure.” Teacher C moreover encourages the whole class to accept the Common Core goals and see what more Sean and his classmates could make mathematically of his unconventional idea. Now, in Mr. White’s essay, since we are starting with the premise that Common Core is good for children, notice the evaluations given to Teachers A-C. But what about those who gave Teacher C low marks, sometimes the lowest marks? Their concerns fell into three categories, all worrisome for the future of the Common Core. Most worrisome were those who felt Sean had made an error that had to be corrected and because of that, it was a mistake to let his error contaminate the whole class. Others felt the teacher’s mistake was pedagogical because having the error named after the student inappropriately shamed him. Others felt that Teacher C simply wasted valuable time as this “odd/even number” conjecture was never going to be on a standardized curriculum test and they, and their districts, want their teachers to focus on what the state will test. Clearly, the topic of numbers being both odd and even has no mathematical future and is not going to be raised by anyone ever again. Forgive me. They all sound good to me… Read them over again…. But that would not cause this post to be written. Mr. White completely disagrees…..
Sean, of course, has not made a mistake, and as his conjecture shows, and as too many faculty and students overlooked, he fully grasps the principle that Teachers A and B taught. He is in fact doing the kind of thinking that the Common Core standards also hope to see when they ask students to “make sense of problems and persevere in solving them, reason abstractly and quantitatively, construct viable arguments and critique the reasoning of others, attend to precision, look for and make use of structure,” and so forth…. And this is deemed good for education? As a standard it sounds noble, especially when italicized. But in the example provided, it is completely ridiculous… And that is why Common Core is going to so confuse children, especially children in the inner cities who don’t get meals, who can’t do homework, who don’t have parents involved with their education because their night job gets them home at 11:50 pm… 2, 4, 6, 8, 10, are even… 1, 3, 5, 7, 9, are odd… any questions? Let’s practice counting by evens… let’s practice counting by odds… everybody got it? Recess. I learned fine that way. So did you. So did our whole generation. So did the generation before them…. But now, we are encouraged to have a discussion about “Sean numbers” which to be honest, I couldn’t even follow because I had nothing to write with and draw a little map as to how Mr. White was explaining it…. Huh? Could you have handled that in 3rd Grade? “The limitations in their subject matter and pedagogical knowledge *which) unfortunately foster the kind of conventional teaching that would undermine the larger goals of the Common Core and preserve the undesired status quo. If simplicity undermines the larger goal of the Common Core and preserves the status quo, isn’t that now deemed by every parent of a student, to be a good thing? Flat out, here is what is going on here…. Common Core is a very bad program that is impossible to teach, and impossible to grasp. IT FAILS 70% OF ITS STUDENTS IN EVERY CLASS! It is losing support with parents. So what Bill Gates did, was whisk educators off to a green world where there was only one set of alternatives, an alternative universe so to speak… In that alternative universe, Common Core is spun as the most awesome thing that every happened… Mr. White descends back to reality… And suddenly, his ideas plop down in a real world where there are 30 students in a class, all going WTF is wrong with this teacher? Please, STFU and lets learn something real. This is an example of not being in the “real world”…. With regard to how we will know whether we have succeeded in the Common Core experiment, we won’t know for sure until the tests we mandate find a way to respect and reward the ingenuity of students like Sean…. By failing 70% of Delawares children… Why? Because they don’t know that numbers can be both odd and even…. That is Common Core. That is why all parents are against it. The bottom get pissed on. The heavy line shows where you would be if the average rate of growth from across the years ’79 to ’10 were applied evenly. The lighter line shows the reality…. 99% of us are all earning an average of $18,000 less than we should be… So how does this break down? The bottom fifth of households saw their income go up by 29.2 percent, well below the 53.4 percent average. Income for the middle fifth of households grew by a measly 19.7 percent. But how did people a little higher up, but not at the very top, do? A little better, but still below average: households between the 81st and 90th percentiles—so in the bottom half of the top fifth of the income ladder—had just 39.1 percent income growth. Again, well below that average of 53.4. So how far up do you have to go before you hit the average? The 91st to the 95th percentile almost got there, with 53 percent average growth. But they fell just short. Households between the 96th and 99th percentile seriously exceeded 53.4 percent, though. They had average income growth of 78.1 percent. That’s nothing compared to the top 1 percent, though: Their income grew by 244.7 percent, close to five times the average. 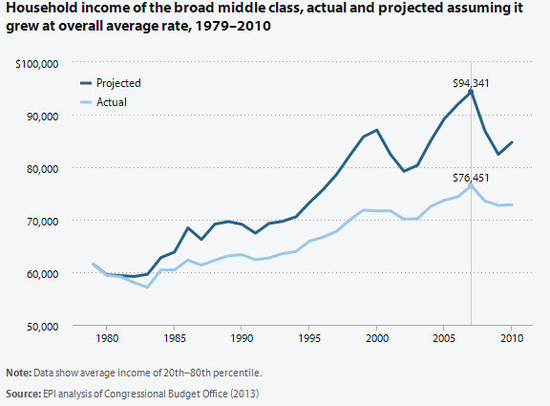 It is clear that most of the overall income gains from 1979 to 2007 bypassed the vast majority of American households. As such, their living standards are lower than they would be had these gains been shared more broadly. Ways To Share More Broadly. A. Raise the Minimum Wage: $10.10 is a start. B. Organize More (and throw out ineffective current bosses) Unions. Override All State Laws Outlawing Unions. C. Reduce Wage Theft: charging workers for uniforms, drinks, food, supplies. Cheating on overtime. All the rest: no change…. On top of this, allow all money put into capital improvements, to be deducted dollar for dollar. (Capital improvements require building things). The rational is that if you put that money into capital improvements, you are improving this nation as much as if you were directly paying taxes to it. Perhaps more so. This can be done, but it must be done with a Democratic Executive, and over 60 Democrats in the Senate (or change the filibuster rules), and a fully Democratic House. That is what has to happen for any change. If it doesn’t happen then Americans rightly get what they deserve for being stupid. Because we all know that Republicans are quite happy with the very fact that you ARE making $18,000 less than you should and quite happy that they are the ones receiving it, not you……. It wasn’t supposed to go that way. And it shouldn’t go that way…..